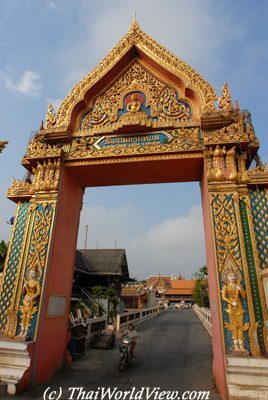 During centuries in Thailand, most of schools (โรงเรียน - "RONG RIEN") were installed inside Buddhist temples. Monks were teaching pupils. 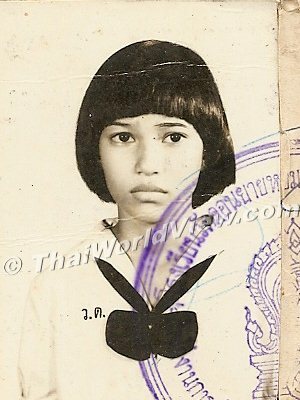 Due to Dharma (ธรรม - teachings of the Buddha) rules, little girls did not have the opportunity to study and reach a high level. The only alternative was for boys. They had to enter the Sangha (สังฆ - Buddhist community) and then could study in the Bangkok Buddhist universities. Only since Rama V (1853 - 1910), school is mandatory for both boys and girls. Since that time schools are under the state rule. Schools are mandatory from age 6 up to 15. 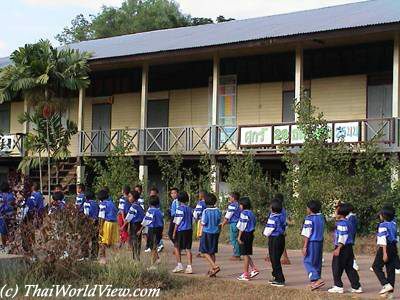 It is compulsory for children between the ages of six and fifteen to attend school in Thailand. After the mandatory schooling is completed, attendance rates drop up to 50 percent, according to some statistics. Only a small percentage of students continue their education beyond secondary school. 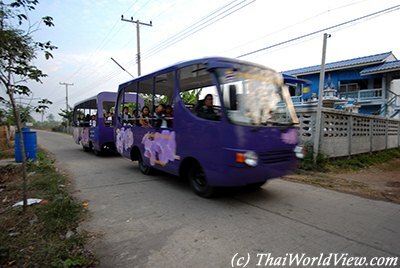 But the attendance rate of Thai children attending primary school is still very high. 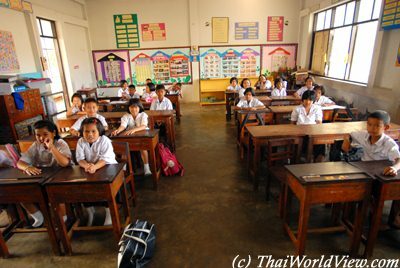 The attendance rate of Thai middle-school students - measured in 2006 - was 89%, compared to a world average of 79%. 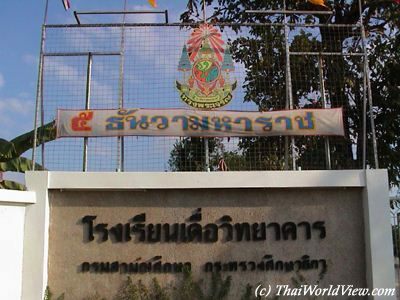 Thai high-school students had an attendance rate of 65%, compared to a world average of 51%. Meanwhile, the attendance rate of Thai college students - 41% - was still considered acceptable. 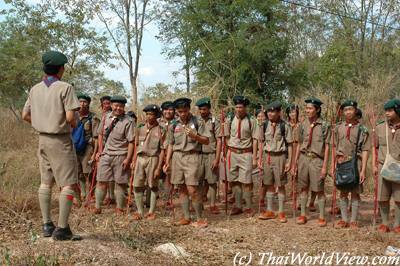 The first six years are called "PATHOM" (ปฐม). The last six years are called "MATHAYOM" (มัธยม). It is divided into two sections of three years. Lessons in "PATHOM"'s first year focus on respect toward parents, a green world, to help each other, to take care about the forests, not to cut trees to avoid floods, to take care about public belongings, not to forget one's word, to respect Thailand, to listen to the parents, to dislike robbery, to read in order to have knowledge. During the 1997 Asian economic crisis the number of children in school has not diminished at all, it has even increased. Some parents realised that education is the most important thing. In poor rural area like "ISAN" (อีสาน - northeastern part of Thailand), many children used to stop going school even before twelve years old. Especially little girls because parents thought that the girl shall find a husband and therefore no education was necessary. Also in poor families children stopped learning in order to help their parents to make a living. Often the older sacrifices him-self to help the younger. Previously children from rural villages rarely had the chance to study many years because their parents worked on paddy fields. They wanted the children to stay at home and to take care about the house. The children were forced to stay away from school during rice farming season because buffaloes were not allowed to wander in the fields. They would ruin and eat the crops. If their parents don't have enough money, the children cannot go to school. Sometimes parents cannot afford to purchase school uniforms - white shirts, blue trousers or skirts, white socks - and take their children out of school rather than lose face by having their child go to school without uniform. Some remote hill tribes villages don't have official governmental schools. Hopefully such village schools, mixing children with different ages, teach the basis to pupils. Some Northern temple schools give free education to poor young hilltribe people as many remote ethnic minorities are neglected. In older time, schools were in temples. Sometimes, when governmental schools were established, monks still teach but received no salary from the government. In year 1999 more transparence was asked about the Grade 1 entrance exam results. Some universities or private schools refuse to give them. Some say bribes ("tea money") allow entrance, no matter what test scores they achieve.. 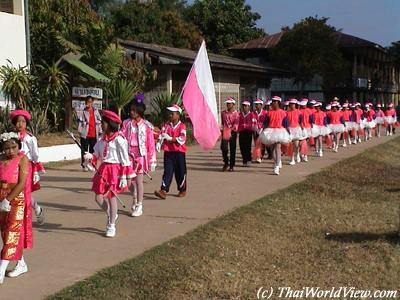 In 1999 a revolution in Thai education was announced for year 2000. There shall be freedom of choice of subjects to study, and no more mandatory textbooks. The radical changes are to switch the emphasis from rote learning to developing creativity and a questioning mind. In Thai society children are highly valued. In a bus, a person gives his seat to a child but not necessarily to an old person. It is contrary of foreign view. Since year 1999 provisions for the state to provide 12 years of free basic education won the legislature's approval. Lawmakers agreed the state must provide free compulsory education for nine years, and another three years of free schooling for those who wish to further their studies. In 2001 teachers and school executives who succeed in changing their teaching methods to suit the new learner-centred education may be paid bonuses. Thailand's new syllabuses for 12-year compulsory education, which would be officially used in year 2002, emphasise understanding, not rote learning. 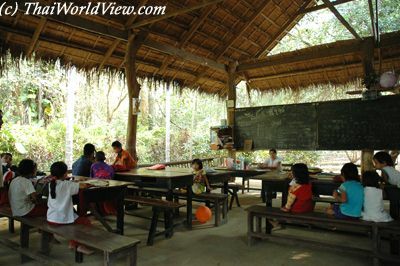 Thai classrooms are large with classes of 50 students or more. Qualified teachers are found to be concentrated in elitist schools due to better salaries. There is a problem distributing teachers with similar educational backgrounds and experience as well as learning materials to schools in remote areas. A Thai superstition says that adults shall not drink or food left by their children as they will not be afraid of parental authority anymore. In year 2010 test results in Thai schools have shown a failure rate of more than 80 per cent in mathematics, biology and computer studies among the teachers. More than 84 000 teachers and school directors took the exams, the first of their kind. The poor results have ignited controversy about educational standards. 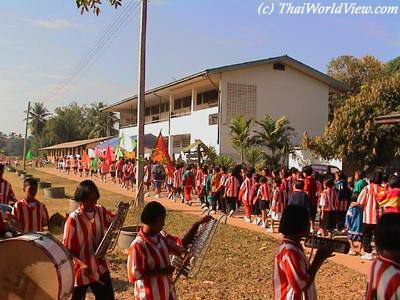 Many feasts happen in Thai schools such as Sport day, Teacher's day, Children's Day, the Queen's day and so on... The Children's Day features child-centred activities, most of which were to encourage the creativity and skills of children as well as to support the underprivileged. Teachers Day (วันครู) is an occasion for pupils to make merit for their teachers. 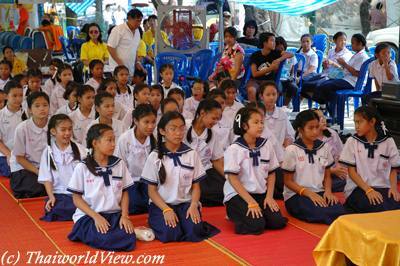 Teachers are highly worshipped in Thailand for their knowledge. Pupils don't dare to embarrass their teachers. This day happens on the 16th January. Holidays for children are of course during summer. But in Thailand summer (or hot season) is during months April and May. A large percentage of rural students drop out after Grade Six - at only 12 years of age - even though the government mandates nine years of free education. Transport and uniforms are some of the added costs that make school unaffordable to poorer families. 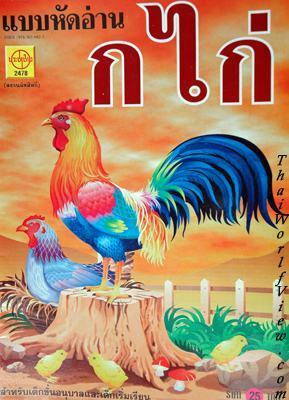 Thai alphabet is quite difficult for young Thai children. It takes a few years to master the whole alphabet, read and write. 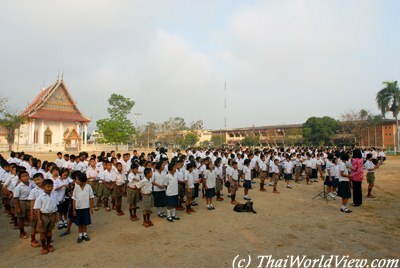 Every morning, Thai pupils need to line up before the flagpole. 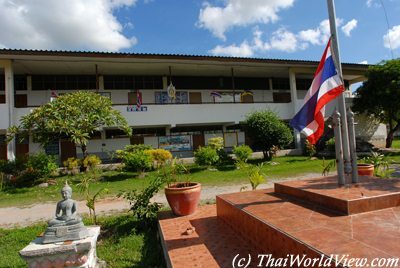 They have to listen to the head teacher and show respect to the Thai flag. 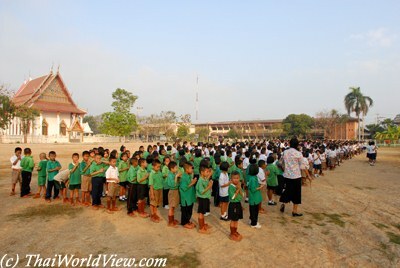 Pupils have to stand up very straight while singing the Thai national anthem. School girls and boys are standing in rows and line up before the flag pole. The Thai flag is hoisted at 8 AM sharp. Children show respect to the flag and are standing up very straight while singing the Thai national anthem. 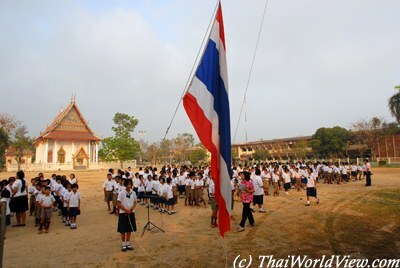 A pupil is singing the Thai national anthem. Another pupil is saying Buddhist auspicious sentences. Happy school children are waiting for their teacher who is late today. In village school, it is acceptable for a teacher to arrive late if he was present and helping at a temple fair the previous night! Tooth brushes with individual name are present in each classroom. Children need to remove shoes when entering into the school building. They put the shoes in front of the classroom wall. In the evening around 4 PM, pupils are standing in rows again. The head teacher says a few sentences and then releases them. It is time to go home. Many parents are waiting for their kids and bring them home by riding a motorbike. Many children have to do their homework by them-selves. Some children can go back home thanks to the shuttle bus provided by the village.